Pants & Skirts There are 17 products. 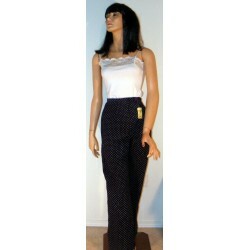 What a fun and bold print on this pair of palazzo pants. Lots of movement and flow in these very wide legs. Pretty, gray wool skirt made by Pendleton Woolen Mills! 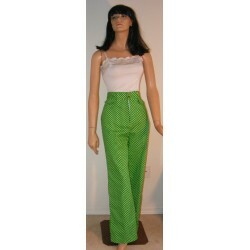 The pleats have been stitched until just below the hips. They give this skirt lots of movement and kick. Pretty multi shades of gray strips mixed with red and a little white (almost plaid pattern) look great. Longer, below the knee length. Vintage look and styling in this warm, Pendleton wool skirt. 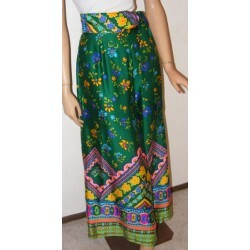 Great, colorful long skirt from the 70s! Made of suede leather, the top and side panels are black. The tan, pink, maroon and green patchwork suede leather pieces really set this skirt off. Eight snaps at the front let you have as much movement as you want - not to mention show as much or as little leg as you like. Sleek and professional gray, wool skirt with belt. Terrific, classic design which never goes out of style - great for work, or any occasion for just the right classy look! Beautiful texture on this black and white skirt! Vintage styling from the 1980's, a terrific addition to your work or career wardrobe. 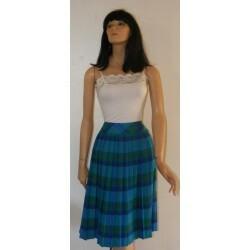 Very nice mainly blue, plaid skirt from the 1970's - 1980's. Made by Koret of California, and from its' Career line. 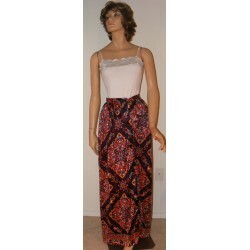 Great paisley and colorful medallion really pop on the dark blue background of this long, maxi skirt from the 1970's. Beautiful ribbed texture to the fabric really adds to the look and feel of the slightly, slinky fabric. Buttons up the front let you show as much or as little of your leg as you want!